The Hemingway name echoes through modern American life - but not just as a symbol of literary greatness. The name also carries with it stories of mental illness and suicide afflicting numerous Hemingway family members over the generations. Now, actress Mariel Hemingway herself tells her family's troubled tale in the incisive, revealing and ultimately uplifting new film Running From Crazy . It comes to DVD and Video-On-Demand from Virgil Films on October 28, 2014. 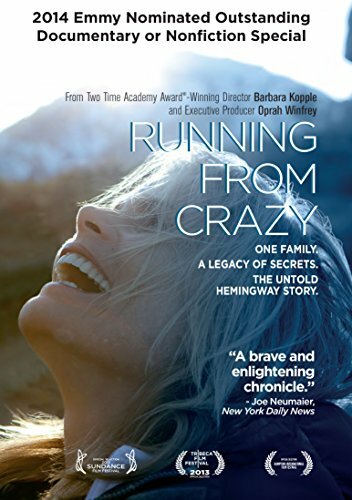 From two-time Academy Award-winning director Barbara Kopple and executive producer Oprah Winfrey, Running From Crazy examines the personal journey of Oscar-nominated actress, author and mental health advocate Mariel Hemingway, the granddaughter of Ernest Hemingway. The film follows Mariel as she strives for a deeper understanding of the suicide and mental illness that have afflicted so many of her family members, including her supermodel/actress sister Margaux Hemingway, who committed suicide near the anniversary of Ernest's own suicide, and her eldest sister, artist Joan "Muffet" Hemingway, who was diagnosed with manic depression and now lives in Idaho. Recalling a childhood framed by alcoholism, cancer and misery, Mariel admits to a support group for families of suicide, shown in the film, "Knowing that there's so much suicide and so much mental illness in my family, I've always kind of been 'running from crazy,' worried that one day I'd wake up and be in the same position." Intimate verite footage and raw, emotional interviews with Mariel herself are interwoven with stunning, rarely seen archival footage of the three Hemingway sisters and their parents. Mariel also reluctantly reveals a troubling belief she now holds about her alcoholic father, Jack Hemingway, who died in 2000. Directed by acclaimed two-time Oscar-winning filmmaker (Harlan County U.S.A., American Dream) Barbara Kopple, Running From Crazy is a true testament to the sheer power of the human spirit and our ability to rise above the sadness of our past to find a better, happier tomorrow. Says Hemingway in the film, "I want to change the dynamic and I want to change the viewpoint that it's actually not a family of tragedy, that it's a family of complete and total life-embracing joy." The Huffington Post called Running From Crazy "one of the most memorable films at Sundance." Eyesin.com said it reveals "many family secrets, some very beautiful, some very tragic." Kyle Smith of the New York Post said, "It's Margaux, the tragic supermodel and failed actress who took her own life at 42, who emerges as the film's fount of heartbreak in several stunning scenes."